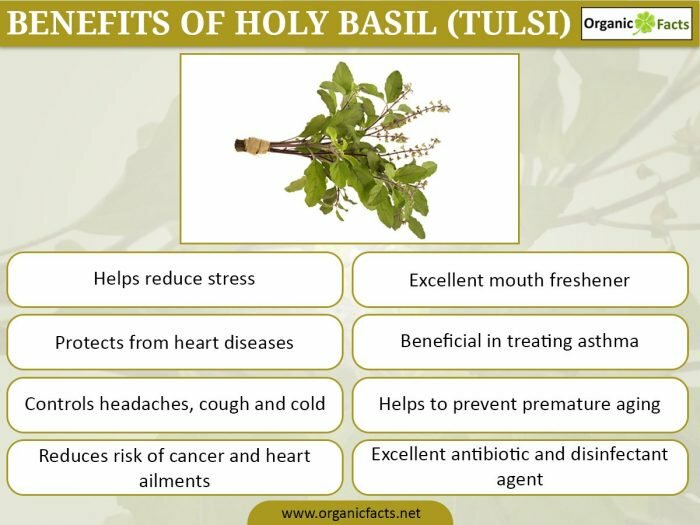 The health benefits of "Holy Basil", also known as Tulsi, include oral care, relief from respiratory disorders, as well as treatment of fever, asthma, lungs disorder and heart diseases, to name a few. Holy Basil, which has the scientific name Ocimum sanctum is undoubtedly one of the best medicinal herbs that have been discovered. It has endless medicinal values and has been worshiped and highly valued in India for thousands of years. Tulsi is commonly found in two varieties – the green coloured Lakshmi tulsi and the purple hued Krishna tulsi. 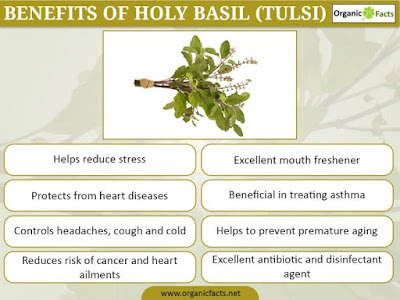 The miraculous healing properties of Holy basil come mainly from its essential oils and the phytonutrients in it. Holy basil is an excellent antibiotic, germicidal, fungicidal, and disinfectant agent and very effectively protects our body from all sorts of bacterial, viral, and fungal infections. 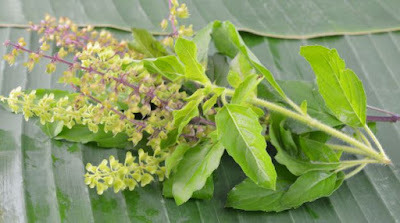 It is an old practice in India to have a decoction of tulsi leaves and flowers in case anyone is suffering from a fever. The compounds like Vitamin C, camphene, eugenol, and cineole present in the essential oils of tulsi not only cure the infections in the lungs but also cure the congestion in them. Furthermore, they are found to be effective in healing the damages caused to the lungs due to smoking and tuberculosis, and prevents lung cancer. It also helps to cure tuberculosis due to its antibiotic properties. Holy basil contains vitamin C and other antioxidants such as eugenol, which protect the heart from the harmful effects of free radicals. Additionally, eugenol is very beneficial in reducing the cholesterol levels in the blood. Vitamin C and other antioxidants in Holy Basil, apart from repairing damages done by free radicals, also minimize the stress caused by these oxidants. They soothe the nerves, lower blood pressure, reduce inflammation, and thus reduce stress. Potassium in Tulsi, also reduces blood pressure-related stress by replacing sodium and loosening the tensed blood vessels. 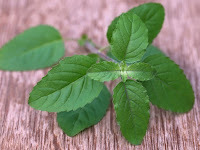 Tulsi is an excellent mouth freshener and an oral disinfectant and its freshness last for a very long time. Holy Basil destroys more than 99% of germs and bacteria in the mouth and this effect can last all day. It also cures ulcers in the mouth. Finally, it is known to inhibit the growth of oral cancer which can be caused by chewing tobacco. Tulsi, being a detoxifier and a mild diuretic, helps to reduce the uric acid level in the body, which is the main culprit as far as kidney stones are concerned. It also helps clean out the kidneys through increased frequency of urination. Acetic acid and certain components in Tulsi essential oil facilitate dissolution of the stones. Finally, it has pain-killer effects and helps bear the pain from kidney stones as they pass. Try taking a bath with a decoction of Holy basil mixed with your bath water, washing your face with it, or simply applying the paste of its leaves on an infected area of the skin in case of skin diseases. 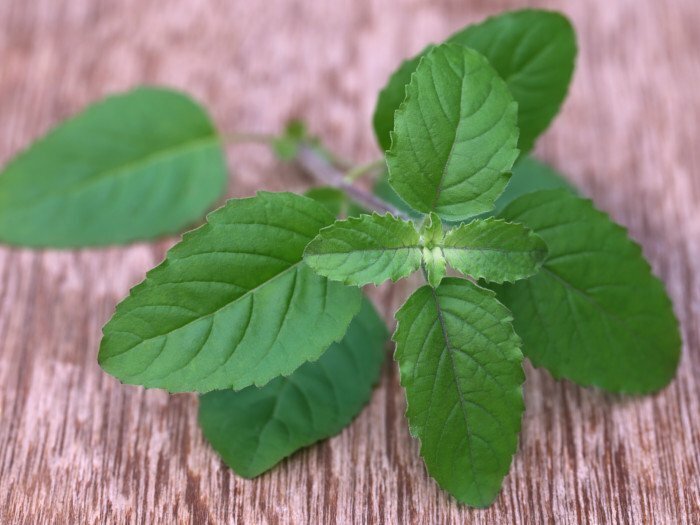 Rubbing holy basil leaves or its extracted oil on the body keeps mosquitoes and other insects away. It cures skin disorders both internally and externally, without any side effects. Vitamin C and A, phytonutrients, and the essential oils in Holy Basil are excellent antioxidants and protect the body from nearly all the damages caused by free radicals in the body, which are hazardous byproducts of cellular metabolism that are responsible for a wide swath of diseases, including cancer. In the traditional Indian medicine system called Ayurveda, it is considered as a tonic to retain youthful vigor and avoid premature aging.